Producing engaging content is the number one challenge for content marketers. 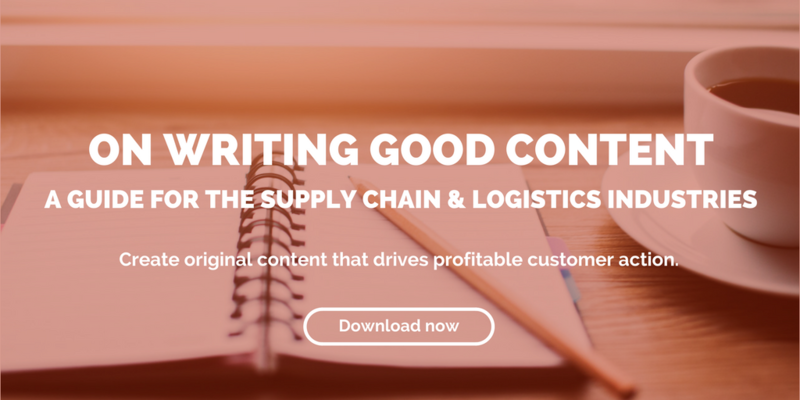 You may think it should be simple: Write, post, get more customers. But content marketing is much more complex, demanding more time, thought, and careful strategy than churning out a few blog posts. First and foremost, what you produce must engage readers. 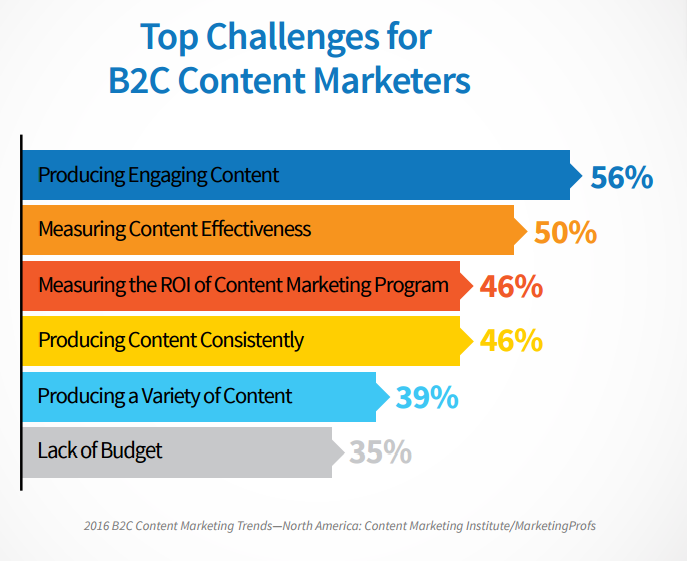 This is, however, the biggest content marketing challenge facing both B2B and B2C marketers. 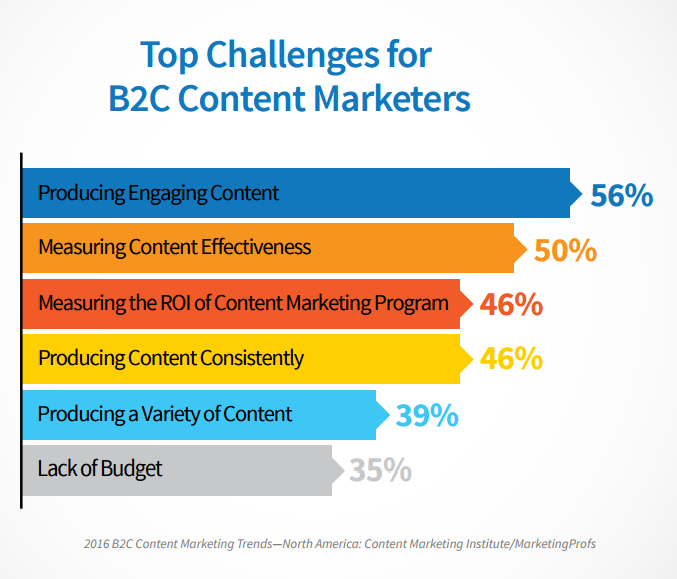 2016 reports produced by Content Marketing Institute and MarketingProfs, and sponsored by Brightcove, found that the number one challenge for B2B and B2C marketers is producing engaging content. Unfortunately, if you lack engaging content, it works like a domino, knocking down all your other marketing efforts. For one, it is much easier to gain the support of the C-suite, and be granted a reasonable budget, for your content marketing plan if you can show that your strategy is attracting more customers, helping with conversions, and driving sales. But if your content is not producing results, you won’t get the support and resources you need to produce the content, which, in turn, fuels results. It is a vicious cycle. That being said, lack of engaging, quality content may be indicative of other challenges you may be facing, like the resources to produce content. Research your customer demographic. You must know who your audience is, what they want to know, how they want to learn it, and where to find them. Use web analytics to learn how your audience interacts with your website, what kinds of posts and emails they are reading, and where improvements can be made. Do your due diligence and learn how to reach those potential customers with topical information they want and will read. This means conducting a solid analysis of trends in your industry and producing content that offers expert information on these subjects or answers pressing questions potential customers may have about them.  You, thus, will establish your organization as a trusted voice for your industry. This leads to dialogue with prospects and customers that want to learn more from you about industry news — or, even better, who are interested in your products or services. Research your distribution channels. This can affect not only what you post, but where and when you post it. Know your target’s social media habits, when they read emails, and what they are looking for. Research your competition and learn which channels they focus their attention on and why. Read the latest industry publications and influential blogs to uncover what topics work to engage their readers. Look for trends and answer to them. Look at SEO evaluations and site audits to help identify new middle- and bottom-of-the-funnel opportunities for content. If creating engaging content has proven to be challenging for your business, consider outsourcing your content creation, or your marketing program all together. According to Social Media Today, lack of marketing staff can make it difficult for organizations to produce enough content to keep up with their competition. Quality research and consistent creation of engaging, relevant content is time-consuming and requires keen writing skills. Promoting your posts on social media also takes time and requires consistent effort. Some of the most successful organizations put this task in the hands of an expert that can create and leverage content to provide the greatest impact to your brand, lead generation, and new customer conversion rate.